Arts Center of the Capital Region and it was great to see several generations of pressure cookers present and stories they shared. People brought their pressure cookers and we made several dishes, including a stew of beans and meat inspired by the French dish Cassoulet. We replaced the traditional duck with chicken, but tried to stay true to flavor combinations. I saw on their eyes a level of anxiety as they heard the noise made by the steam coming out of the pressure cooker regulator, but in the end, I think they all left confident they too, can make delicious and fast foods on a budget. Here a video by Test Kitchen: what to look for in a Pressure Cooker. In the pressure cookers, start by browning the sausages, reserve. Add chicken cook until golden and reserve for later. Add to the pressure cooker the vegetables and sweat for a couple of minutes. For the spices, if using fresh, 1/2 Tbsp, less if you are using dried. It also depends on personal taste. One can always adjust and add a bit more fresh herbs before serving. Lock the pressure cooker lid in place according to manufacture directions and set to high heat until 15 psi has been reached. You will hear and also see the steam coming out of the pressure cooker regulator. At this point, set the timer for 10 minutes. Open the pressure cooker according to manufacture instructions, drizzle some olive oil, and seasoned bread crumbs and serve. 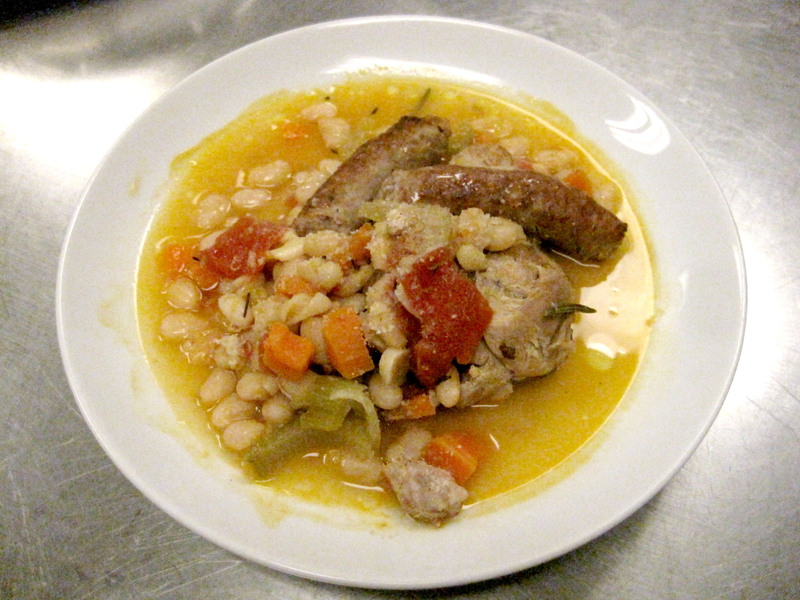 Thanks for the Cassoulet recipe. I recently purchased a pressure cooker because I got tired of using pots and pans to make my food as they just seem to cook away all the nutrients. I used this review site to help me pick. It’s really useful for anyone looking to buy. I’ll definitely give this recipe a try. this recipe is somewhat incomplete. I hope that i have guessed properly and it turn out ok. It does not say when to add the tomatoes or the browned meat and it does not say how much water or a measurement for the spices. After sauteeing the vegetables, I added two cups of water and the beans. I pressure cooked them about 15 minutes, reduced pressure and added a large can of seasoned tomatoes (instead of fresh) and the meat and various spices and pressure cooked it for about 15 minutes more. I guessed at spice amounts. It tasted really ggod and I am making it again this week.